Sounds fantastic at first sight, but having a deeper look, some questions on the methodology arise. There is a very insightful post from Edelman’s Matthew Gain who observes that, for example, Nielsen’s study period (May 7 to June 6) clearly plays in favor of Nike’s YouTube campaign. Will Nike be able to keep up the momentum once the tournament has begun? What about non-English content which has been excluded here? And should we assume that the only goal is to create social media buzz? So here’s the full picture. When Nike’s video appeared on YouTube, it created a massive spike between May 20 and May 22 (chart on the right). Since then, Nike’s volume is trailing off. On the other side, Adidas’ media footprint is steadily rising, up to the inauguration match on June 11. If we consider only mainstream media, which is basically the influential press and web, Adidas is actually taking the lead at the beginning of June, relegating Nike to a second position (chart on the left). Since then, Adidas is more often mentioned by the traditional media outlets. Is the FIFA partnership paying off at the end? 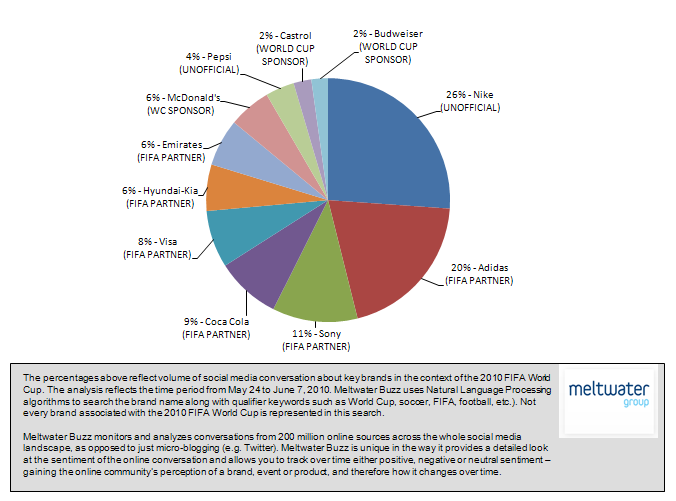 Methodology: Dow Jones Insight tracks media mentions of the FIFA World Cup sponsors in traditional media and social media in 23 languages. Georg Ackermann is Team Leader in the Dow Jones Insight Media Lab in Singapore.